Leading trailer manufacturer, Freighter will be displaying its rugged Outback model at the Brisbane Truck Show in May. Built specifically for conditions present in areas such as rural Queensland, Freighter Outback trailers can handle the demanding requirements of Australian roads, making them ideal for transport operators serving the mining industry. Speaking ahead of the show, Freighter General Manager Rod Cunningham points out operators need to ensure appropriate trailer equipment to suit the task when undertaking these rugged jobs. Mining industry work often involves transporting heavy loads off-road or over unsealed roads in poor conditions, which can combine to damage or break an ordinary trailer designed for predominantly highway use. Freighter’s Outback Series of trailers has been purpose designed to carry heavy equipment on terrains of varying quality. Feedback was sought from operators on their expectations from their trailers in order to survive the tough conditions of the Australian outback. 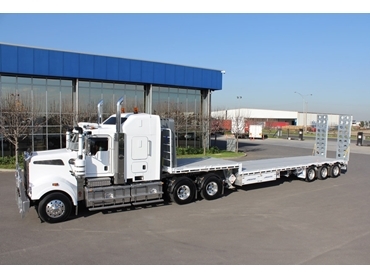 Based on the response, the new range of trailers was designed to incorporate various heavy duty features, and tweaked and tested to arrive at the final product. Freighter will be showcasing a drop deck Outback semi trailer with rear ramps and small foldaway ramps from the lower to the upper deck at the Brisbane Show. Freighter can be found on stand number 30 at the Brisbane Truck Show 2013. The show runs from 16th to 19th May, at the Brisbane Convention and Exhibition Centre.